Lynn Mathre is President and Founder of Asset Management Advisors, Inc. (AMA). Lynn has focused her professional career on the application of tax aware wealth management methods, and has provided comprehensive wealth management to professionals, executives and retirees since 1983. Prior to establishing AMA in 1986, she served as Managing Partner of a financial planning firm and has more than four years of tax practice in public accounting, including the international tax practice at Arthur Andersen. Lynn has been profiled by Business Week, Journal of Accountancy, Smart Money and Bloomberg Wealth Management, and featured on the PBS Program, The Financial Advisors. She was recognized in Texas Monthly Magazineas one of the Houston Region’s 2011 and 2010 Five Star Wealth Managers and in a special edition of Houston Woman Magazine as one of the 50 Most Influential Women of 2009. Lynn holds a Master of Accounting (1980) and a B.A. in Sociology from Rice University. 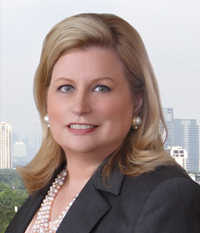 She was a board member of the United Way of Greater Houston, serving on the Executive Committee, the Audit Committee, and Chair of the Finance Committee. She is a member and former co-chair of the United Way Women’s Initiative Steering Committee, a member of the ADT Committee, Retiree Initiative Advisory Committee, and Planned Giving Subcommittee. She was former President and continues to serve on the board of the Orange Show Foundation for Visionary Art, which produces the largest annual art car parade in the country. She also serves on the board of Houston Public Media. Lynn is a finance committee member and former board member for Post Oak School, the Montessori school her daughter attended. She has chaired and supported numerous charity events over the years. In her leisure time, she enjoys traveling with her husband Stewart O’Dell, a fellow Rice graduate.